Rachio allows users the ability to share access of their Rachio controller without disclosing account credentials (username and password). We offer three types of shared access: Complete Access, Limited Access, and Transfer Ownership. To compare the three, visit this article. Complete Access allows another user full access to your zones, schedules, settings, etc. This is great for sharing your controller with family or property managers, and allows the other party to make changes to your settings. Great for family, property managers, etc. To use Complete (formerly Shared) Access for mobile and web apps, follow the steps below. 1) In the Rachio app, select the "More" tab, click on Shared Access. 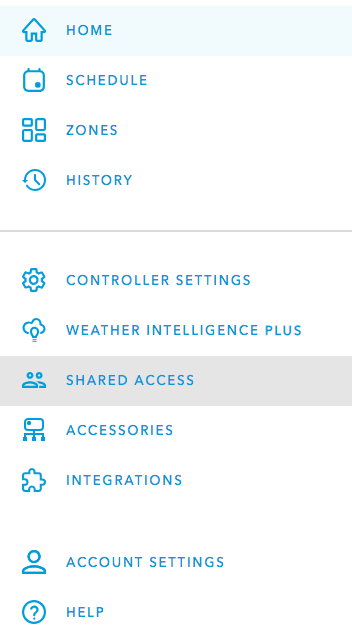 2) From the Shared Access screen, select "Share Access" (if you have not previously shared a controller) or the blue plus sign, and then "Complete Access". 3) When asked who you would like to share Complete Access with, enter the email address of your desired recipient (this can be a family member, trusted neighbor, or anyone you would like to have full access to your account). 4) Once access has been shared, the person you shared access with will appear within the Shared Access screen. Access can be removed on a device by clicking "revoke" next to the name of the person whose access you'd like to remove. In some cases, the controller may not immediately appear on the screen of the person with whom you shared access. If this is the case, please instruct them to close out or force quit the application and reopen it, or select the refresh icon on the app Home screen. 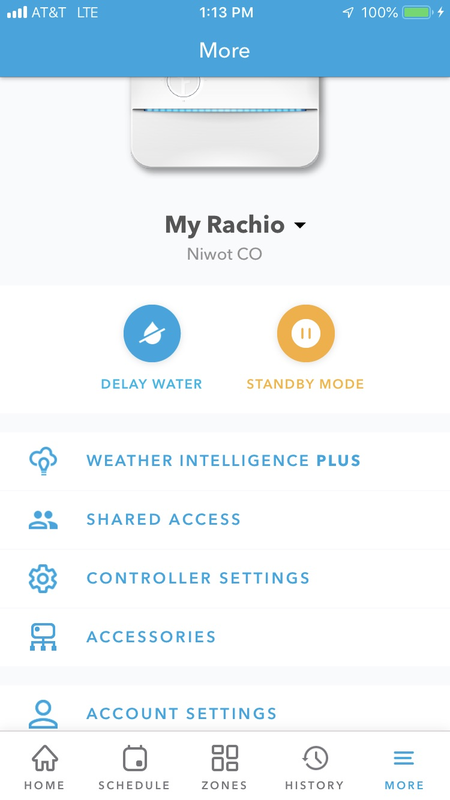 5) For complete access to work, the invited user needs to have a Rachio account. If complete access is granted BEFORE sending the invite, the invited user will receive an email from Rachio asking them to sign up for an account (assuming we do not have the invited user's email address in our database). 1) From the main Home screen, click "Shared Access" on the left menu. 2) When the Access window opens, click "Share Access"
3) Choose the type of access you want to use in order to share the Rachio controller. Complete access will allow the shared user to make changes to your Rachio zone and schedule settings. Shared access will only allow the shared user to run your zones using the remote run function. Complete access requires the shared user to have their own Rachio account. Shared access will send the shared user an email with a link to access the controller without the need for an account. 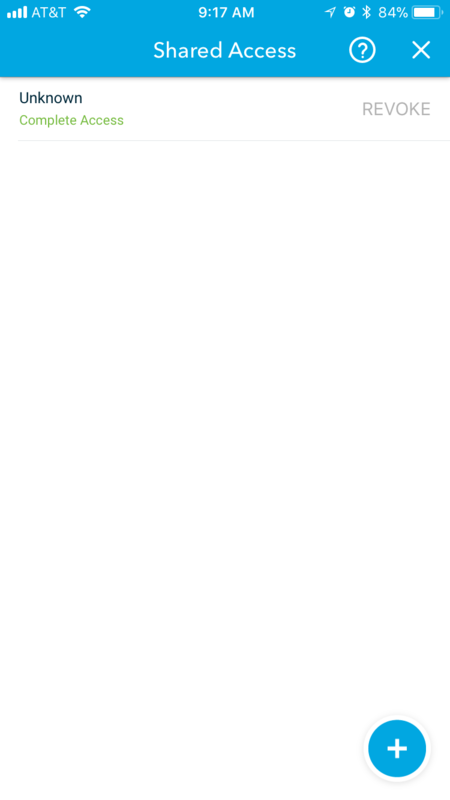 4) Enter the email address for the person who will be sharing access to your Rachio, then click "Grant Access." If you share complete access to a user without a Rachio account, a window will popup stating that an email has been sent to the user with instructions on how to register for a Rachio account. 5) Once access has been shared, you can view all shared accounts in the access panel. To remove an account from shared access, simply click on "Revoke."